Thursday August 20th 1896 It looked like rain this morning so we hurried to go over the river. The most of our invited company came and every body agreed that it was a day delightfully spent. To add to the pleasure of all Harry Mason came unexpectedly. We had a picture taken before the company seperated. It was a day to be remembered. Friday August 21st 1896 Will and I went down early this morning to look over the Vogt place. I did my work after I came back. I went over home in the afternoon to bid Ida good-by as she and Nellie go home tomorrow. Will was hauling corn. weather very warm. 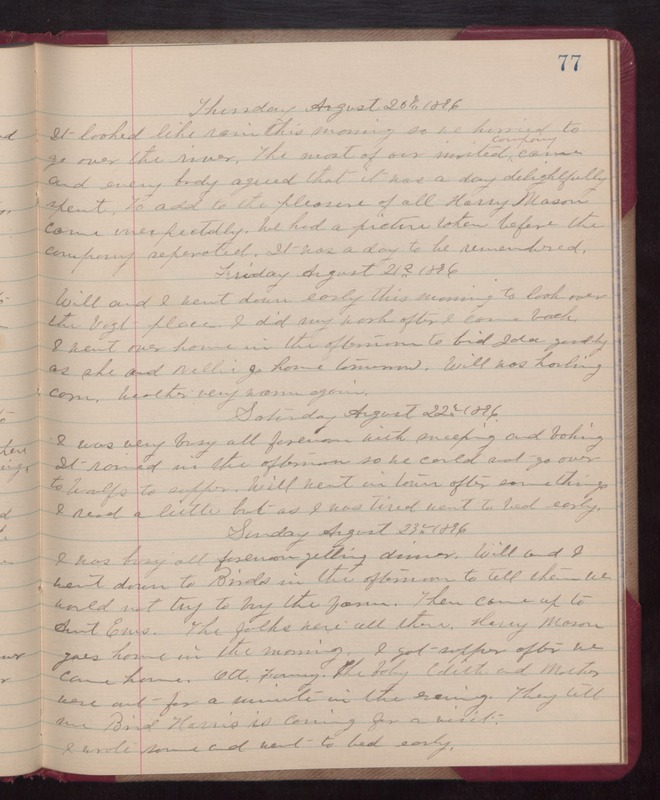 Saturday August 22nd 1896 I was very busy all forenoon with sweeping and baking. It rained in the afternoon so we could not go over to Woolfs to supper. Will went in town after some things. I read a little but as I was tired went to bed early. Sunday August 23rd 1896 I was busy all forenoon getting dinner. Will and I went down to Birds in the afternoon to tell them we would not try to buy the farm. They came up to Aunt Ems. The folks were all there. Harry Mason goes home in the morning. I got supper after we came home. Ott, Fanny, the baby, Edith and Mother were out for a minute in the evening. They tell me Bird Harris is coming for a visit. I wrote some and went to bed early.